Place lime juice and wasabi paste in a small bowl and stir to combine. Cut avocado in half lengthways and remove seed. Scoop out a bit of flesh using a small spoon. Cut flesh into bite-sized cubes and add to lime dressing. Toss to coat and set aside. Place salmon, edamame beans and sesame seeds in a bowl and toss to combine. Toss through avocado pieces. 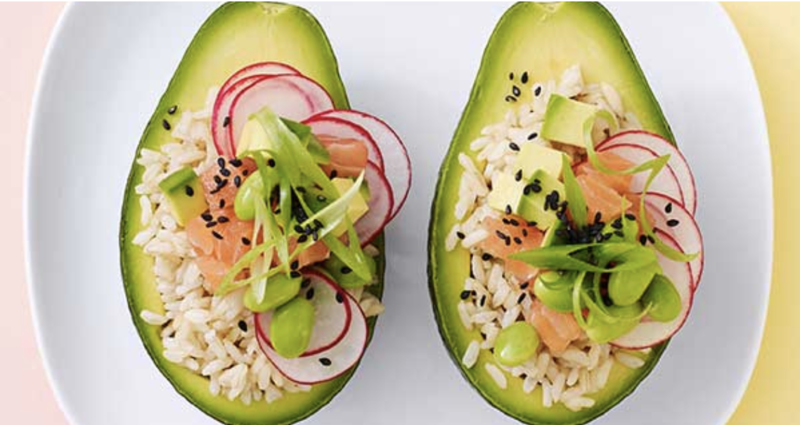 Divide rice among avocado skins then top with salmon mixture. Sprinkle spring onions to serve.